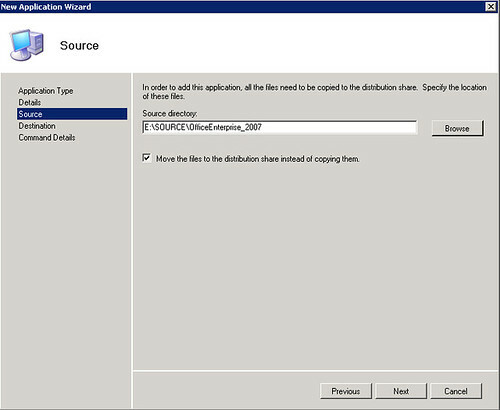 On the first post of this series, we’ve managed to install MDT 2010 and its requirements, prepare distribution share and task sequence, add Windows 7 image to use it as reference and create the deployment point. 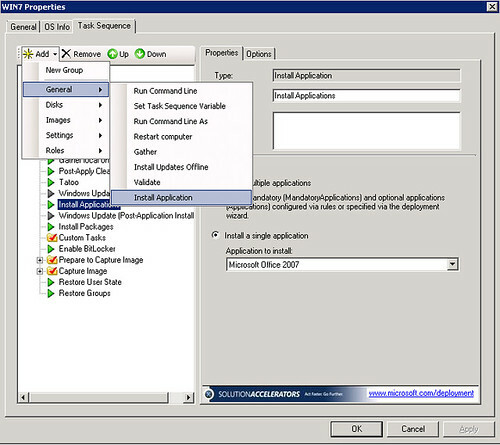 We are now going to add Office 2007 as an application to be deployed included in the OS image and complete the environment to generate the reference image. 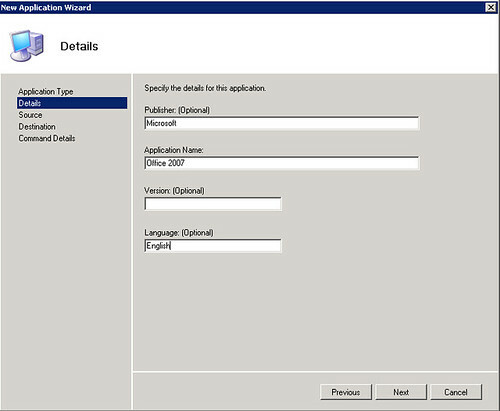 The process of adding an application like Office 2007 it is quite simple, the only trick is to get the application to install silently (or unattended) without requiring for user intervention , we’ll see how that works. 2. Select “Application with source files”. 3. Complete the data about the application. 4. Select the “Source Directory”. Since I have it on the hard drive, I’ll check “Move the files to the distribution share instead of copying them”. 5. Keep the directory name as suggested: “Microsoft Office 2007”. 6. On “Command Details” introduce the name of the executable for Office 2007: “setup.exe” and click on “Finish”. 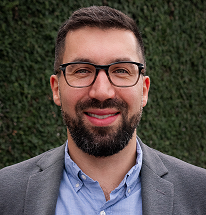 We’ll add the special arguments to achieve silent installations in next steps. 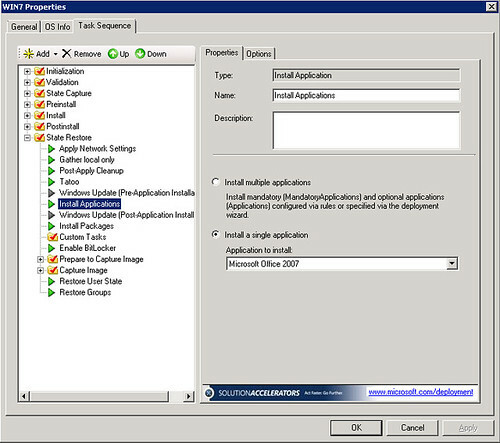 With that performed the Office 2007 is added as an application in Microsoft Deployment Toolkit. 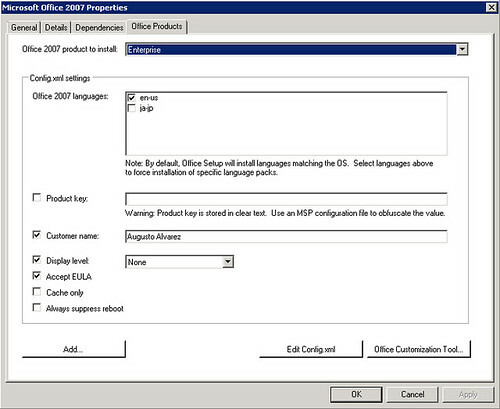 MDT also detects automatically the options available for Office products, this way we can modify them in a simple way. To achieve this, we are going to use the mentioned feature of MDT to generate a “Config.xml” file that is used for personalizing installations of Office 2007. This XML is a very flexible option that we can modify according to our needs and generate ourselves custom and unattended Office suite installations. 1. 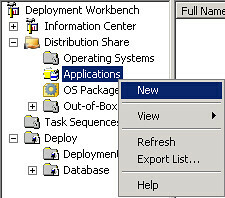 Access the Application Properties from the “Deployment Workbench” console. And get to the “Office Products” tab. 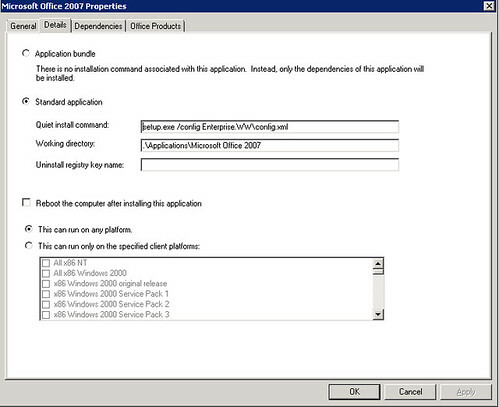 Office 2007 Product to Install: Enterprise (this is the version that I’m using). Product Key: If applies, select your PID. Display Level: None. This will generate the silent installation. This XML file will install all the components of the Office 2007 Enterprise suite. If you want to continue customizing the components to be installed, check this example of Config.xml that selects only Word, Excel, OneNote, Outlook, PowerPoint and remove remaining components. For more information about Config.xml customization check this link: Config.xml file in the 2007 Office system. With the previous steps we have already added the Office suite and configured to a silent installation. Now we need to introduce it on the task sequence prepared on the previous post. 1. “Deployment Workbench” > “Task Sequences” > “Win7” > “Properties”. 2. Access the tab “Task Sequence”. Here are all the steps involved in the process, you can check all the options (most of them did not appear on the Task Sequence wizard) and change their values or disable specific steps. 3. The step that we are interested in is “State Restore” > “Install Applications”. Select “Install a single application” > “Microsoft Office 2007”. Click “OK”. If you later want to add more applications to the same task sequence, use the same step on this task sequence, select “Add” > “General” > “Install Application”. 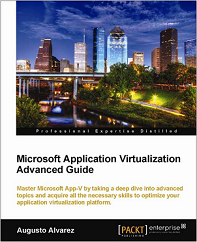 The application must, of course, added already to MDT. Now the installation of Office 2007 it’s included on the “Deploy Windows 7” sequence and will occur silently with the parameters included. On the next post we’ll see how to boot and generate the Windows 7 image that will be captured and ready to be deployed on your environment. First of all i would like to thank you for the great article! 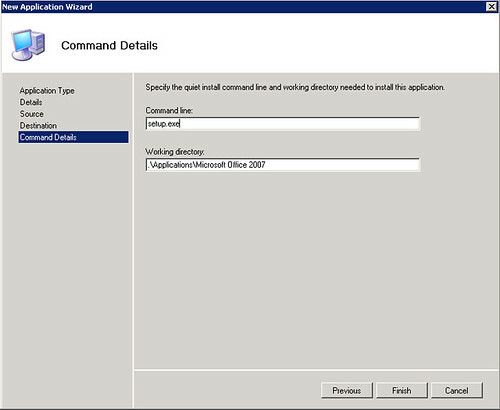 Is it possible to use MDT 2010 to deploy applications to already preinstalled windows 7? 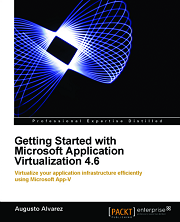 For example i would like to deploy only office 2007 or another application. 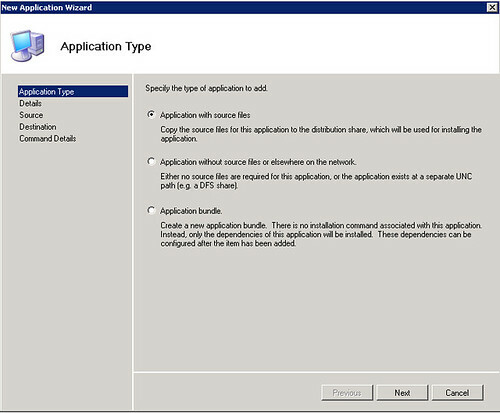 An another wuestin is it possible to use MDT to update already installed applications. 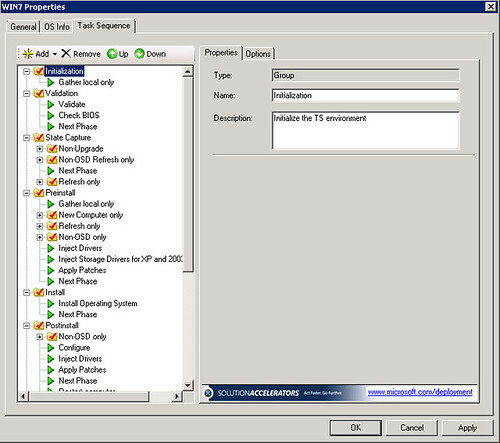 To deploy and update applications you can use System Center Configuration Manager 2007 (SCCM), that also works with MDT task sequences. Thanks for the guide, its really good. But I need to install the multiple applications (so end user can decide if they want all or some of them….) can you tell me how to do that ? I’m working on a new set of posts about MDT to use a more customized scenario.